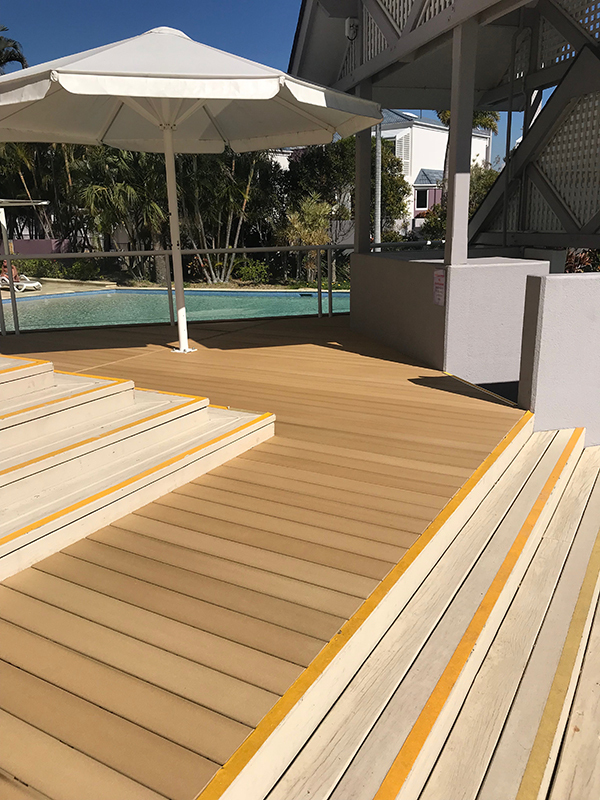 Contemporary Decks designs and installs premium quality decks and timber outdoor structures in some of Queensland’s loveliest homes and commercial projects. The Coastal lifestyle, with its emphasis on the outdoors, makes decks, pergolas, balconies and patios a practical home extension. Free standing Bali huts can enhance your pool area, providing an extra outdoor entertaining area – perfect for Queensland’s weather. Adding a deck or other outdoor extension can also add value to your home, allowing you to make the most of the outdoor lifestyle of the Gold Coast, Sunshine Coast or Brisbane. Timber screens, another specialty of Contemporary Decking can be used around the home in a number of places. They can form a privacy screen between waterside homes on waterways or between apartments and townhouses. Timber screens can also be used to hide unsightly utility areas. Contemporary Decks also provides roofing to Gold Coast, Sunshine Coast and Brisbane home owners and commercial projects. From classic timber decks and timber screens to wooden pergolas, gazebos and commercial projects, the team at Contemporary Decking can help. Contact Contemporary Decking for your next timber project. You can also see our Terms and Conditions related to Contemporary Decks work. There are many different grades of hardwood on the market today that relate to strength , durability visual appearance and expansion and contraction ratios. We only use the best quality hardwoods simply because it always results in customer satisfaction and the finish is second to none. Contemporary Decks offers a 10 year structural guarantee on all of its works. Our decks are made to last because not a single shortcut is taken We take pride in every single project and ensure that every structural enhancement is taken to magnify the durability of any structure. Attention to detail purely comes from experience and a high standard of finish. This is what really separates us from the rest. We take pride in all of our hardwood timber structures and ensure that each cut and join is of the highest quality and accuracy. Having any project constructed on your residence can sometimes be a little overbearing and an invasion to your normal household routines. That's why we always make a special effort to respect our clients privacy , keep our sites tidy , keep noise to a bare minimum and make our best efforts to complete the project as soon as we possibly can without sacrificing any quality of workmanship. We understand how important it is to keep our clients informed at every step of any project. A clear channel of communication is always kept with all of our clients so that the customer is always informed of each process from start to finish.